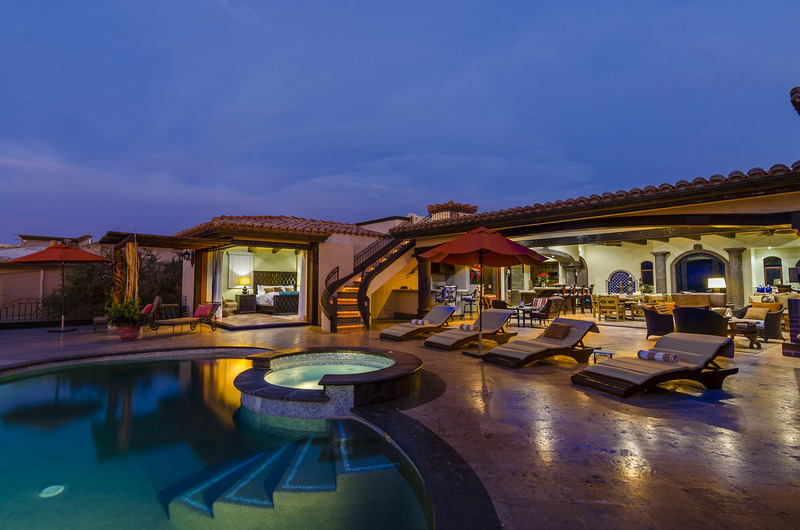 From its privileged vantage point in the Altillo neighborhood of Puerto Los Cabos, Casa Mar y Estrella promises stunning views of the Sea of Cortez and the stars above. The villa offers a wonderful mix of old world charms and cutting edge amenities. From water sports and golf, to just lounging around with your favorite cocktail, there’s something for everyone under the Baja sun! The “Cabo” sun will either beckon you to bask in the bougainvillea laden yard or go for a refreshing dip in the infinity edge swimming pool. As the desert air cools, you’ll find yourself conversing in front of the patio fireplace or relaxing in the hot tub that cascades into the pool. The rooftop deck with fire pit is the perfect perch to savor spectacular sunsets. Indoors, you will find a media room and baby equipment. 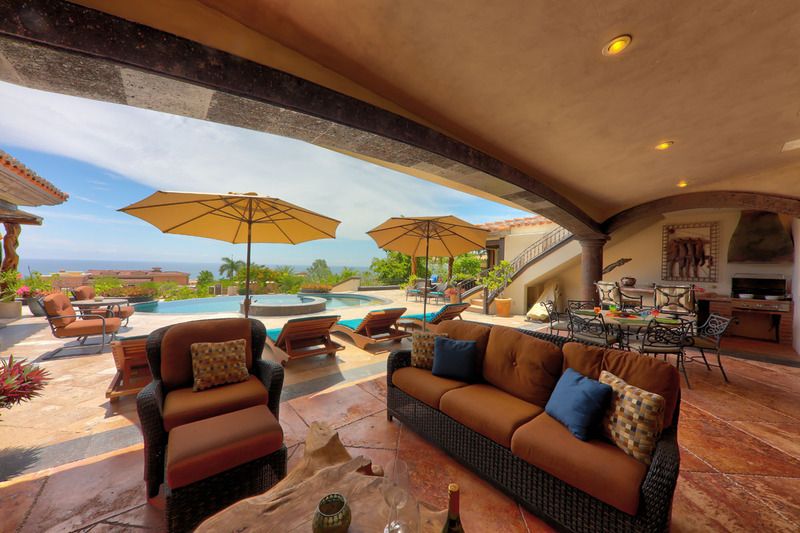 As a guest at Casa Mar y Estrella, you will receive a discount at the Puerto Los Cabos Nicklaus and Norman golf courses. 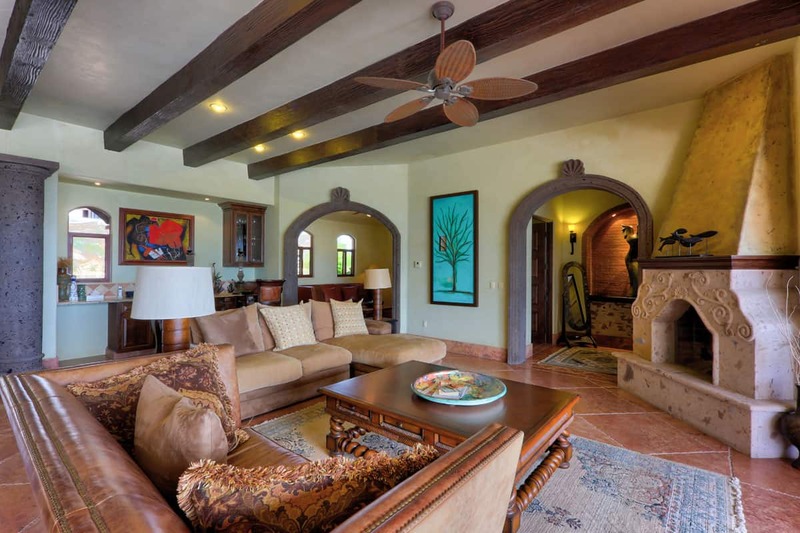 The villa welcomes you with open living spaces, fine Baja craftsmanship that incorporates natural materials and the exceptional backdrop of the ocean. With plush comforts throughout its refined, art-filled interior, the palatial ambience at Casa Mar y Estrella is sure to put your soul at ease. The open plan living area provides a lounge space, a whimsical dining set and a fully equipped kitchen. 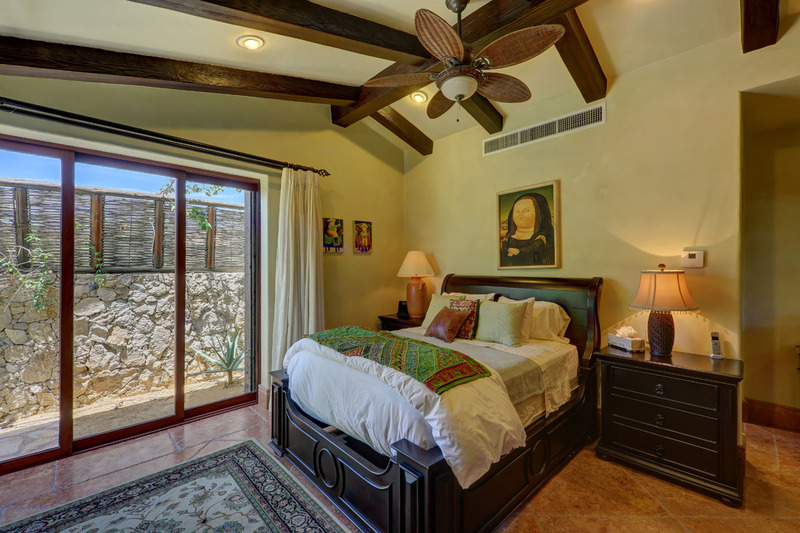 Four fabulous and regal bedrooms accommodate up to eight guests at Casa Mar y Estrella. Solid wooden bed frames and accents provide warmth. Each bedrooms has a private bathroom and air conditioning. Two of the bedrooms provide direct access to the pool. You’ll be just minutes from the charm and character of the Puerto Los Cabos Marina and the old colonial town of San Jose del Cabo. Golf lovers will find a variety of top level courses along the Los Cabos Corridor. Spanish for, “house of the sea and stars,” those will surely be some of the loveliest memories you take away after your stay at this dream tropical villa! How to book the villa? Contact us with the dates you’re planning to stay with us. Once availability is confirmed, we will require a 30% deposit to secure the dates. The remaining balance is due 72 hours prior to checkin. We accept credit card payments through PayPal. Please ensure to read over our cancellation policy.